Zapan first makes an appearance when Daisuke Ido and Alita in her new Berserker Body visit Bar Kansas. Although there are many other hunter-warriors present, Zapan is the only one who is named, revealing that he was one of Ido's patients. When Ido proposes that the hunters band together and go after the infamous criminal Makaku, Zapan makes an exception, claiming that hunter-warriors are lone wolves and that Makaku is none of his business. He claims that to be a professional involves carefully choosing one's prey and minimizing risk. This does not sit well with Alita, who questions Zapan's rationale as a disguise for cowardice. This provokes a fight with the hunter-warriors, as Alita refuses to back down. During the fight, Alita manages to get ahold of Zapan from behind, manipulating his arms and legs and using him to slice up the other hunter-warriors before sending him and the other fighters out of the bar in a heap. He manages to escape Makaku when the latter arrives at Bar Kansas. Zapan next appears after Hugo is leaving Ido's clinic after conducting some repairs. He warns Hugo about Alita, then after Hugo leaves, swears vengeance on Alita for humiliating "the great Zapan" at Bar Kansas. While later staking out Hugo's place, he observes Vector drop Hugo off. This association leads him to suspect that Hugo may be connected to the series of spinal column thefts that have lately been taking place because of Vector's position as the top black market broker who controls the Scrapyard's illegal parts. In disguise, Zapan selects Hugo and his team for a lube job, and catches Hugo in the act just as he is set to paralyze Zapan from behind. He makes quick work of Hugo's accomplices, and only misses Hugo because he is hit with a fire bottle (a portable Molotov cocktail). When he goes to drop off the heads for the bounty, Zapan comes across Alita and Ido, who happen to be at the same factory he visits. Although Alita does not recall him initially he breaks the news that Hugo will soon be a bounty. After Alita runs off in search of Hugo and Zapan collects his chips, he taunts Ido, instigating a fight which results in Ido getting knocked out. Zapan then alerts other hunter-warriors and a netman that Alita is planning to run off with Hugo, and sets up a trap for Alita with Ido as bait to prevent her from fleeing. Incredulous that Alita has apparently killed Hugo, Zapan decies to check for himself and discovers that she has hooked her life support system to Hugo's head, keeping his brain alive. 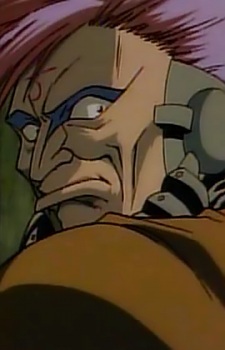 His actions however, appear to the netman as an attempt to rob Alita of her bounty, a violation of Factory Law, and Alita retaliates, hitting him with a blow that slices his face off. Zapan falls off the building they are standing on and is presumed dead.